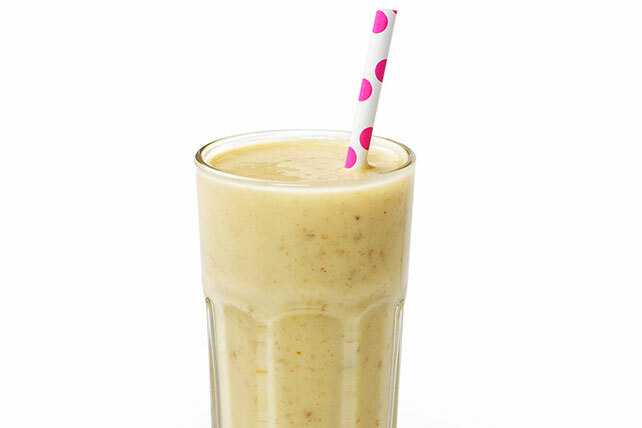 This luscious Fresh Banana Smoothie recipe serves four people. Serve up our banana smoothie recipe and easily satisfy everyone around the table. Substitute 1 cup sliced strawberries for 1 of the bananas. Top each smoothie with 1 Tbsp. thawed COOL WHIP Whipped Topping. Prepare as directed, substituting 1 pkg. (3 oz.) JELL-O Lemon Flavor Gelatin for the JELL-O Vanilla Flavor Instant Pudding, reducing the milk to 2-1/2 cups and using honey-flavored multi-grain cereal flakes with oat clusters. Prepare using honey-flavored multi-grain cereal flakes with oat clusters. Top each smoothie with 1 Tbsp. thawed COOL WHIP Whipped Topping. Garnish with additional fruit.